162 loyalty points Your cart will total 162 points that can be converted into a voucher of 6,48 PLN. YES tasty AMINO HAVE NEVER piles! Do you value quality and effectiveness, but the taste is very important for you? 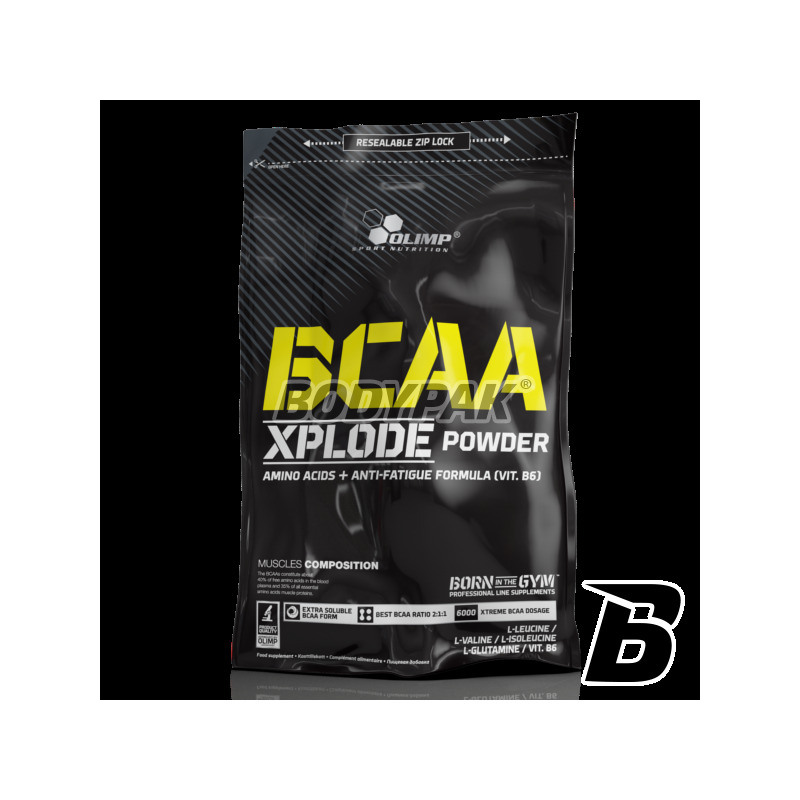 BCAA Xplode ™ is a product that finally will meet all your expectations! Three great fruit flavors: lemon, orange and pineapple, and this thanks to the high quality super-micronized, pharmaceutical BCAA excellent solubility. Thanks contained in the amino acids BCAA Xplode ™ extremely quickly absorbed and immediately available for anabolic processes and energy. FEEL ANABOLIC EXPLOSION OF ENERGY THAT burst your muscles! FASTER REGENERATION, INTENSIVE CONSTRUCTION OF NEW PROTEIN, PURE MUSCLE MASS POWDER! 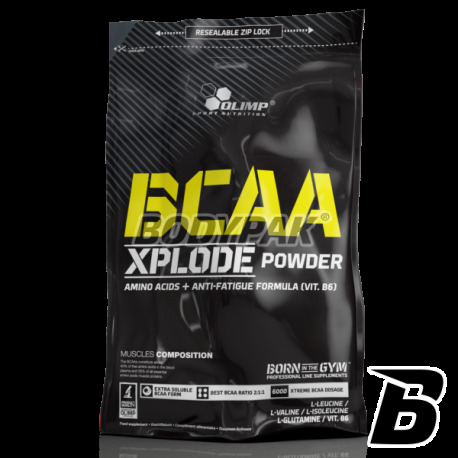 BCAA Xplode ™ is an extreme dose - up to 6000mg the purest crystalline BCAA amino acids per serving - an absolute record! BCAA is a basic component of muscles, constituting nearly 40% of their dry weight! BCAA Xplode ™ are indispensable anabolic bricks that will help you build rock-hard muscles. BCAA free form are absorbed directly into the bloodstream because they do not have to be subject to etching processes, such as protein derived from food. As a result, immediately after ingestion they can get where they are needed most - into the muscle tissue. BCAA in muscles intensify anabolic processes, accelerate protein synthesis, contributing to the rapid recovery time and building lean muscle mass. FORGET ABOUT catabolism! IS NOT THE TRACK HIM! MORE ENERGY TO EXERCISE! LESS FATIGUE! FULL PROTECTION! BCAA Xplode ™ is not only an excellent building blocks, amino acids, which are given before exercise will help protect your muscles against catabolism. During intense exercise, the muscle tissue formed microtrauma, protein released from them as a result of the work of catabolic enzymes is burned for energy purposes, when you run out of energy from glucose. BCAA Xplode ™ administered before training can protect the muscle proteins from breakdown, because it is the branched chain amino acids side in the muscles and in the liver are converted into glucose and can serve as an alternative source of energy. High levels of BCAA in the body during exercise may cause a decrease in production of serotonin in the brain, which helps reduce and delay the feeling of central fatigue. If you want to practice long and hard at the same time protecting the muscles against decomposition BCAA Xplode ™ is the ideal product for you! To strengthen anti-catabolic effect of the product, its composition was supplemented with an appropriate amount of L-glutamine, which is next to the branched chain amino acids side is the second most important ingredient in building muscles. BCAA Xplode ™ OPTIMUM GROWTH RATIO COMPOSITION !! This is an excellent product and a complex containing the amino acids necessary for the body of branched-chain - L-leucine, L-valine and L-isoleucine. To maximize the effects of BCAA, very important it is the participation of individual amino acids. BCAA Xplode ™ contains 6g pharmaceutically pure, super micronized BCAA stacked in muscle optimal ratio of 2: 1: 1 L-leucine, L-valine and L-isoleucine in combination with L-glutamine significantly improve nitrogen balance, which helps to ensure the optimum environment for anabolic processes, as well as the availability of high-quality nutrients. BCAA penetrate very quickly into the bloodstream, and then to the muscles, which accelerate the synthesis of proteins, preferably affecting the growth and regeneration of muscle fibers. During prolonged exercise can be converted in the liver alanine and glucose - is the source of stored energy saving and muscle proteins from degradation. High levels of BCAA in the blood reduces the production of serotonin in the brain, which helps reduce and delay the feeling of fatigue. Recommended daily intake: 1 serving (10 g of powder - 25 units Olimp scoop or 2 flat tablespoons) dissolved in 200 ml of water and drink 1-2 times a day - before a meal or training and after training or before bedtime. Consume immediately after preparation. Do not exceed the recommended daily servings for consumption during the day. Food supplements should not be used as a substitute for a varied diet. A balanced diet and a healthy lifestyle. Note: Acceptable formation of sludge does not affect the quality of the product. Pomimo wyniku ostatnich badań, które pokazały niewielkie znacznie samych aminokwasów BCAA (co innego EAA) produkt dobry - ciężko mi go odstawić przy treningu crossfit. Co ciekawe różne smaki mają różną rozpuszczalność - cytryna super smak i rozpouszczalność, z drugiej strony ananas bardzo słabo się rozpuszczał, przy czym smak dość nieco specyficzny. Z aminokwasów Olimpu korzystam od dłuższego czasu i nigdy mnie jeszcze nie zawiodły. Rozpuszczalność doskonała, smak truskawkowy i naturalne są świetne i doskonale komponują się zarówno w połączeniu z izolatami o różnych smakach jak i same. Cena również bardzo konkurencyjna - gorąco polecam. Cola wymiata, przed i po treningu extra! Doskonała rozpuszczalność. Treningi są bardziej wydajniejsze i dłuższe, a regeneracja szybsza i do odczucia. Kończę 1 opakowanie (1000 g) i na pewno zamówię ponownie ten aminokwas :* ! Bardzo duże opakowanie starcza na długi czas. Nie wychodzi tanio, ale jak na tak wysoką jakość zdecydowanie warto. Świetna rozpuszczalność, bardzo dobry smak. Regeneracja potreningowa zdecydowanie się poprawiła. Polecam ten produkt! Moje pierwsze BCAA, widać że działa rozpuszczalność w bidonie bardzo dobra może za dużo cukru. Polecam!!! Universal Nutrition Amino 1900 - 300 tabl. The product is complete (rich in amino acids BCAA and EAA). By consuming this supplement you will feel how your muscles grow! With the highest quality amino acids used feel what it means to anabolism. Use during the day. Universal Nutrition 100% Beef Aminos - 200 tabl. 100% Beef Aminos is designed for all those who seek the highest quality amino acid product. Advanced 4: 1: 1 ratio of branched-chain amino acids for 1-leucine: 1-isoleucine: 1-valine. Very good solubility of each serving! Protects tissues against catabolism and supports anabolic processes. Highest quality at a good price. Trec AminoMax 6800 - 450 kaps.